A voxel dataset is loaded from a resource. It consists out of 256 slices of size 256 x 256 voxels each. The ILFastSurface class is utilized to quickly visualize a cutting area with arbitrary orientation. 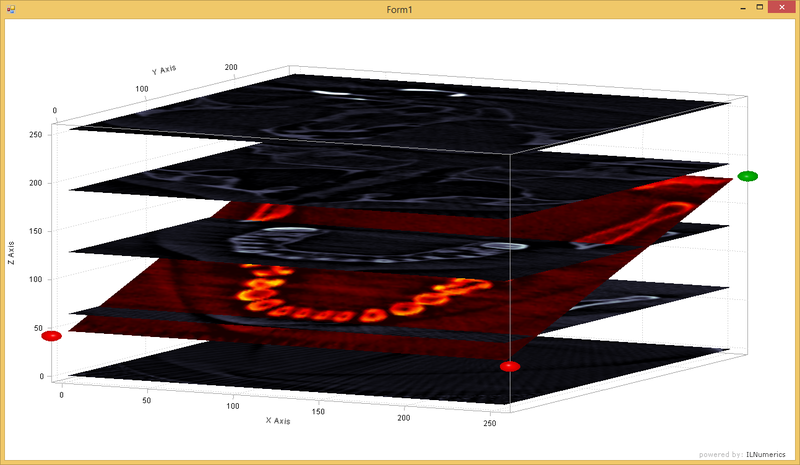 The area is moved through the volume interactively and instantly displays the values projected on the area. Piecewise cubic interpolation is performed on the positions in order to compute the scattered values on the area from the original 3D dataset. Interactivity is realized by 4 dots (scaled down ILSpheres) placed at the 4 z-axes of a regular plot cube. The dots mark the 4 corners of the cutting area. They are individually selected and deselected by the mouse. Selected dots turn red and now participate in moving in Z-direction by the '+' and '-' keys. This instantly relocates the cutting area and visualizes a different area of the volume. Concepts demonstrated: 3D interpolation using interp3s, 2D interpolation using interp2, mouse interaction with arbitrary shapes, combining custom shapes with ILPlotCube axes.